This article discusses test discharging of VRLA batteries. The principal is almost identical to the procedure that should be followed when testing vented Lead-Acid batteries but some important changes are necessary to obtain the correct results. Battery Open Circuit Voltage Characteristics. The open circuit voltage of lead acid cells can give us useful information providing it is used correctly. This article shows the relationship between the open circuit voltage and state of charge of lead-acid cells and how to interpret the values. The values are always considered as that of a single cell and monobloc voltages must be averaged according to the number of cells. This method was developed primarily for VRLA cells where the specific gravity cannot be measured. Measurement of the specific gravity will give a good indication of the state of charge. For measurement of either specific gravity or open circuit voltage, the fully charged and fully discharged specific gravity must be known. Used correctly, the method described in this article will give reasonable results to the state of charge of cells on open circuit. Considerations For Battery Room Design, Battery Stands and Enclosures. This article looks at the preferred designs for battery rooms and discusses how batteries should be laid out to give a safe environment. Alternative battery stand types are discussed to illustrate accessibility of the cells or monoblocs and safety considerations. VRLA, Vented and Nickel Cadmium battery types are included. How Should Industrial Batteries Be Stored? This article discusses the effects of storing VRLA AGM & GEL types and also vented Planté, Pasted Plate and Tubular types. The article covers the effects of time, temperature, humidity and light and also discusses sulphation; lead dendrite growth and corrosion of the internal lead parts as well as corrosion to the pillars and UV aging of the plastic containers. The relationship between open circuit voltage and state of charge is also discussed. A Guide To Lead Acid Battery Connectors. 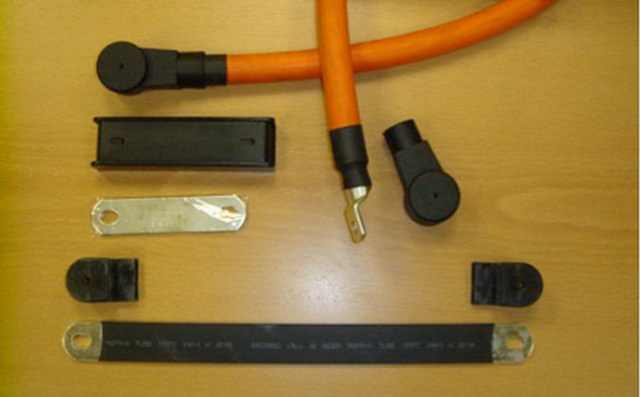 This article discusses the different type of connectors used for batteries in float standby applications. It does not consider traction batteries or those used for cycling applications but some of the practices can be translated to all battery types. The document discusses inter monobloc, inter cell, inter row, inter tier and connectors from the last cell to the transition box, fuse box, or main switch. It does not consider connections from the transition box etc to the load. However, it does make reference to these connections in respect of volt drop. VRLA Batteries – GEL vs AGM. A frequently asked question is, should I use a GEL or AGM battery? To answer this question we need to understand the differences between VRLA GEL and VRLA AGM and we must understand what a VRLA battery is. Simply, a VRLA battery is one which would not normally be topped up with water at periodic intervals which is what has to be carried out on a “vented” battery. Because of this characteristic they have often been miss-quoted as sealed. They are not sealed but have a one way valve to release excessive internal pressure. The design of the valve varies but they all have a pre-set value and when this is reached releases and maintains the pressure within design limits. This pressure is usually low and in the order of 0.5 BAR. Both AGM and GEL are VRLA batteries and have this valve arrangement.